Hanko is a bilingual port town and municipality on the south coast of Finland, 130km west of Helsinki. On the 20th (Sat), stroll through Tulliniemi Nature Path and then tour the pleasant surroundings at Bellevue Beach. For reviews, other places to visit, and other tourist information, you can read our Hanko journey site . Bristol, UK to Hanko is an approximately 10-hour flight. You can also drive. The time zone changes from Greenwich Mean Time to Eastern European Time, which is usually a 2 hour difference. Expect a daytime high around 9°C in April, and nighttime lows around -1°C. Wrap up your sightseeing on the 20th (Sat) to allow time to travel to Imatra. 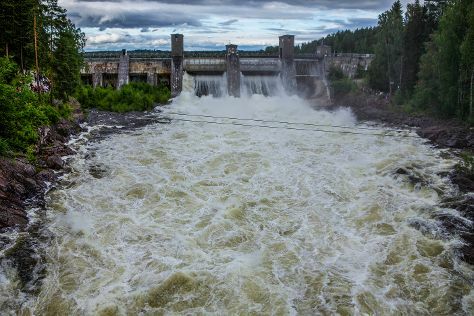 On the 21st (Sun), admire the sheer force of Imatra Waterfall, pause for some serene contemplation at Tainionkosken Church, then take in the architecture and atmosphere at Church of St. Nicholas, then step off the mainland to explore Malonsaari, and finally step off the mainland to explore Lammassaari Island. To see where to stay, more things to do, photos, and other tourist information, read Imatra holiday builder app . Traveling by car from Hanko to Imatra takes 4.5 hours. Alternatively, you can fly. Expect a daytime high around 8°C in April, and nighttime lows around 0°C. Wrap up your sightseeing on the 21st (Sun) early enough to take a train to Kouvola. Kouvola is a town and municipality in southeastern Finland. Kick off your visit on the 22nd (Mon): stroll through Niivermaki Nature Conservation Area and then identify plant and animal life at Arboretum Mustila. To find traveler tips, reviews, more things to do, and tourist information, use the Kouvola trip planning website . You can take a train from Imatra to Kouvola in 1.5 hours. Other options are to drive; or take a bus. In April, daily temperatures in Kouvola can reach 8°C, while at night they dip to 0°C. Cap off your sightseeing on the 22nd (Mon) early enough to travel back home.